Signing up and planning to attend any new activity for the first time can seem overwhelming, but here is a helpful way to get your um, “hoof” in the door for ranch horse versatility. It is important to know that every rider and every horse are all at different levels of development and we all have our strengths – and skills we need to work on. If you jump right in, you’ll fit right in. You will only be “new” once. You spend the weekend on your horse in a learning environment. You participate in an all-day clinic on the first day followed by a low key schooling competition on the second day. On both days you are coached by certified clinicians on all skills a horse on a ranch would be expected to perform. On day two, you compete only with horse/rider teams of your level of ability. At the end of the second day, you receive an itemized score sheet that shows the skills that can use improvement and you’ll go home with some great ideas on what to work on. Receiving some coaching on the Ranch Riding pattern. Unlike a horse show, you participate in all five of the classes: Ranch Riding (something like “cowboy dressage”), Ranch Trail, Ranch Cutting, Working Ranch (reining and boxing for Novice and Limited Divisions or reining, fence work and roping for the Amateur and Open Divisions) and a unique form-to-function Conformation class. Watch this great video narrated by Jay Henson that shows all of the classes that are included in the two day event. What will you need?? A cowboy hat, boots, collared Western shirt, appetite (we do share some good grub,) and a smile! That’s IT – oh, and your horse, any breed. If you are the competitive sort and want to test your roping skills, bring that rope! Many riders look at the variety of skills involved in ranch versatility and realize there is a lot to learn. A number of riders come from trail riding, pleasure classes, barrels, reining, team penning, etc. and are bored with just one discipline. It is helpful if you can lope in a circle, stop your horse, side-pass, trot fast and slow, walk and back-up. Clinicians talk about equipment, conformation, reading a cow, and how to use the most subtle cues necessary to get your horse to do what you want. 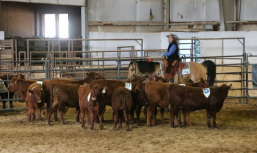 Clinician discussing the best way to enter a herd in the cutting class during the clinic. Many first time horses have never seen cattle – let alone cut a cow out of a herd. Our clinicians will help you develop and fine tune all the skills you need. You will identify resources that can help you, and discover a whole new world of fun with your horse. 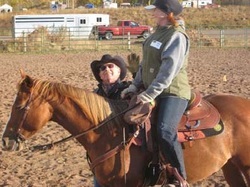 Colorado versatility ranch events are not cutthroat, although some of us do get competitive at times. You compete mostly with your own prior score. There is an occasional jackpot, your points do accumulate for National and Colorado awards long term and seasonally, but you won’t win money. You may win a saddle on the National level and the Colorado VRH year end buckles are beautiful, but most people want to have a good time and improve their horsemanship, and that’s what you can expect at your first event and throughout the season. Working on roping skills in the clinic. Everyone gets a chance to practice roping, but roping is included only in the Amateur and Open Division competitions. We, at the CoVRHA, invite you to learn, improve, and promote the American Ranch Horse. Make 2019 the year you launch your horsemanship skills! Attend our combined clinic schooling competitions, meet new friends, and get expert instruction in a small group setting. All of your new friends and fellow horse enthusiasts will help you with anything you ask. All breeds of horses and all levels of ability are welcome. Put the Colorado Versatility Ranch Horse schedule in your calendar now and make a plan to join us this year. Like us on Facebook for current information. Negotiating a bridge obstacle in the Ranch Trail class on competition day. Our clinicians help you learn to give your horse effective cues for obstacles, but you are never required to do something that you and your horse are not comfortable with. Cutting a cow during the schooling competition. Working Ranch Horse. Fence work is included for competition in the Amateur and Open Divisions. Many riders watch this and think they will never do this, but you may surprise yourself! Penning a cow in Novice Ranch Cutting.